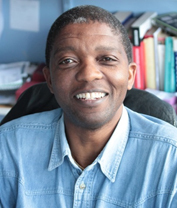 Dr. Frank Matose became Director of EHS in 2018, and is a senior academic within the Sociology Department of the University of Cape Town. His research interests are in environmental sociology with a particular focus on Southern Africa, placing emphasis on the intersection of local people, the state, capital, forest conservation, and protected areas. Interests in these areas are informed by intellectual projects around environmental governance, social justice, knowledge, and power relations. He has been involved in these intellectual projects for more than 25 years of research within the Southern African environment, and is currently writing a book titled; Hidden Politics in Conservation: Forests and the Power of the Weak in Southern Africa. His current research projects are on “Common Access to Natural Resources for Transformation and Environmental Justice” and “Militarisation of conservation in Southern Africa”.